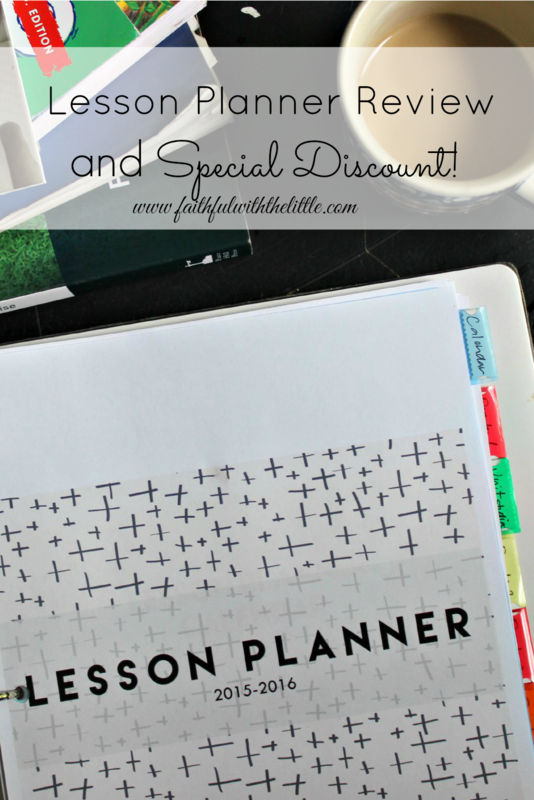 faithful with the little: Lesson Planner Review and Special Offer! Although we have been homeschooling through the summer, our school load has been much lighter and has not required much planning. 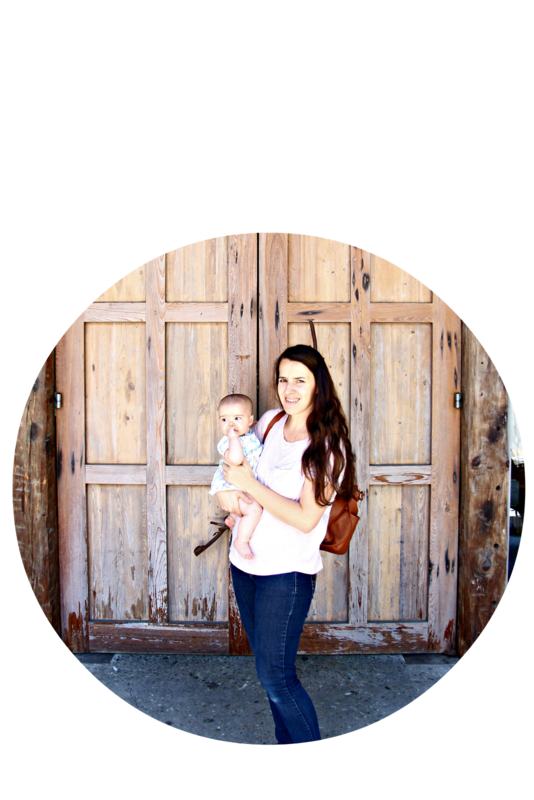 I have basically wanted to work on our core subjects while keeping the kids accustomed to doing school work. We also are going to take a chunk off of school in the fall and winter so it has become a no brainer why we should continue school through summer. Come August we are getting ready to go into full gear and that means lesson planning. Lesson planning has always been a daunting task for me. I generally like things to be neat, clean and in their proper places but I have come to find that I am unfortunately organizationally challenged. In other words...I don't know what the heck I am doing! 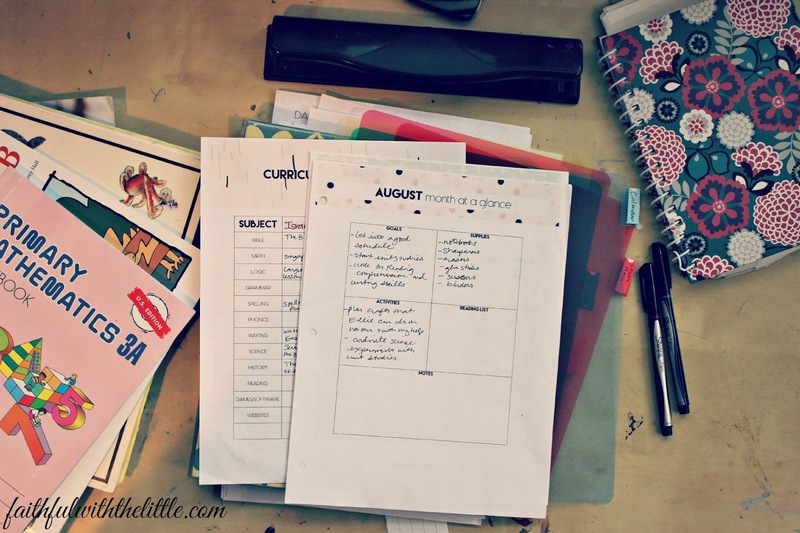 (at least when it comes to lesson planning)Thankfully there are people out there who are actually gifted with amazing organizational and planning skills. Though I am sure it helps to be born with these talents; I am gleaning as much as I can from those who are blessed in this area and trying my darndest to get as organized as I possibly can. 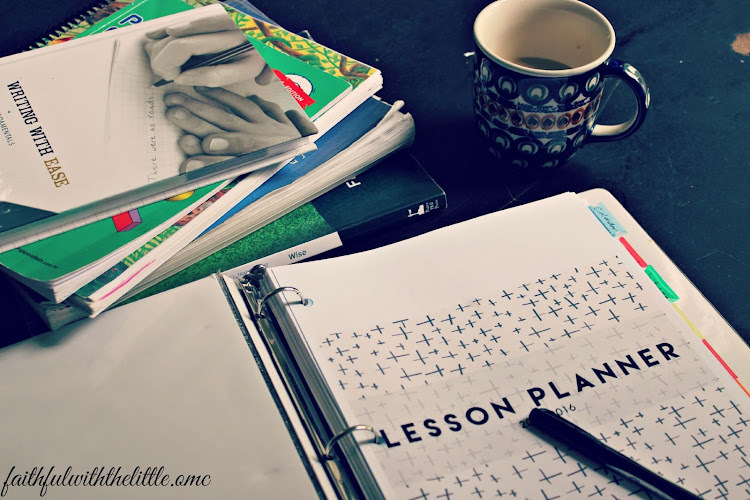 Last year I hunkered down and determined to lesson plan; even if it drove me to tears. So I did...a whole week's worth and it took me a whole week to do it! After we went through the first week of planning, I kind of winged it for the rest of the year. I knew pretty much what we needed to do and we had a schedule but I felt like a merry go round with all the kids on top of me pushing me in different directions. " Mom, what are we doing today? Mom, what do I do now?" It was causing me to become very dizzy, as you can imagine. That is why this year I have solemnly vowed to take the time to make time and succeed in the lesson planning department. I might not figure it all out at once or plan our year perfectly, but I sure am going to try. I knew her planner was the one for me. It was just what I was looking for! It is detailed yet concise; cute yet functional. I love that she has month by month pages as well as a full calendar. I also really liked the calendar just for unit studies and that she has the planner separated into quarters so it is easier to break down the year. It has everything I could want out of a planner and to top it off... she shows you how to use it! I can't believe I am saying this... but I am actually excited to start lesson planning! What has happened to me!? What ever it is, I am ready for the new, more clear-headed me! Just knowing that I have a good foundation of lesson planning in place for our school year, gives me such a feeling of accomplishment. I can feel the weight of the school year and all that it comes with; getting lighter and lighter. Not only am I reveling in this new found joy, but I want you to also. Do you struggle with lesson planning, organizing and figuring out what you need to accomplish for your children's education? I am right there with you! Even if you are not gifted with amazing organizational skills I believe that you can still become organized and tackle lesson planning with ease and excitement by learning from those who have paved the way. Alicia has been so gracious to offer a discount on her planner to all of my readers! Yay! So if you are getting ready for the school year and don't know where to start. 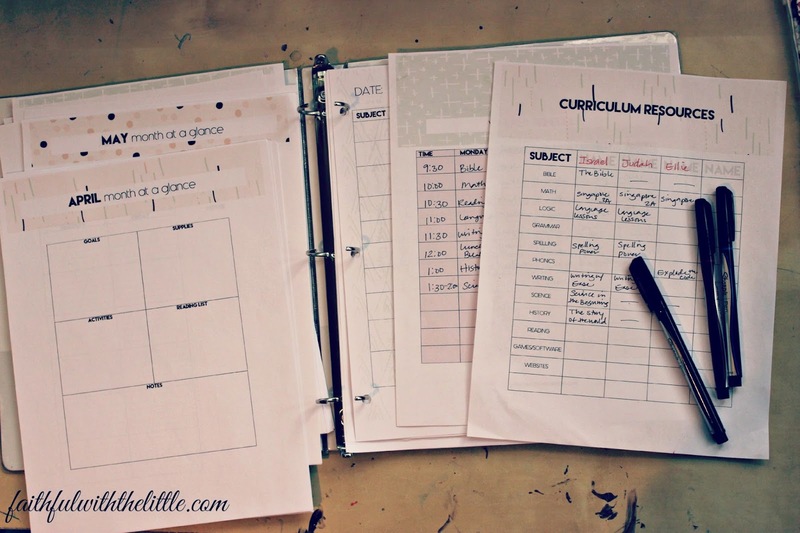 Start by ordering her planner and let her help you make it fun, and dare I say easy! 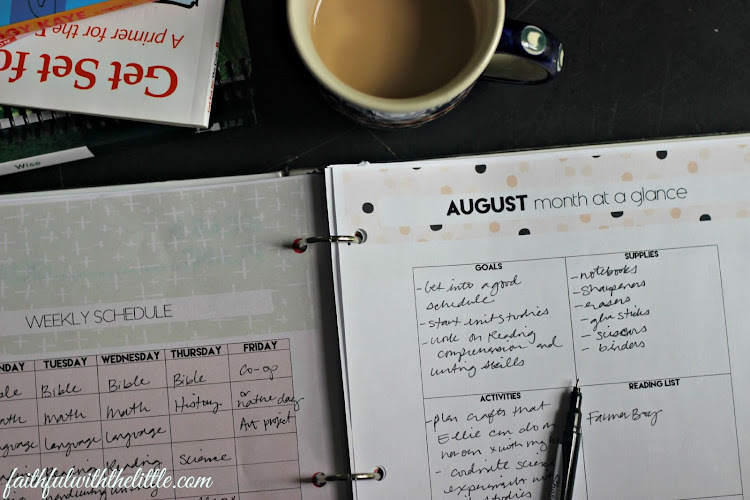 You will also want to read her very helpful post on planning your school year. I still have so much to learn about lesson planning and I am sure will do a lot of tweaking throughout the year but I know I am getting off to a good start thanks to Alicia! If you would like to get your school year started off right also, go order Alicia's Lesson Planner!! Make sure to take advantage of her special $2 discount just for faithful with the little readers! 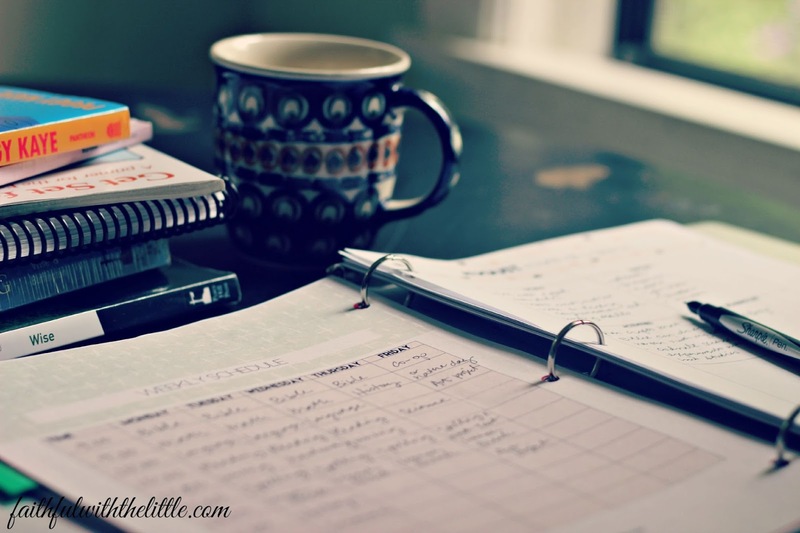 (So make sure to subscribe today to my mailing list...no pressure;) Her planner was already very reasonably priced at at $7.50 and will now be only $5.50 for you! :) Enter the code-- (FAITHFUL2)-- and be on your way to a well planned school year!! Happy Planning!